Ok All you Star Wars Enthusiasts, I like many after watching Star Wars The Empire Strikes Back had an overwhelming urge and completely awesome inspirational moment …. Dude…. I’M GOING TO MAKE A LIGHT SABER… Which of course shortly there after, I jumped on Google and found a massive amount of Theoretical Particle Physicists , talking about the basic qualities of light and energy. Which quickly made me realize that making one of these things wasn’t going to be easy. But then I thought, well obviously some of the technology isn’t available yet but building a less powerful light saber shouldn’t be to hard… and when the technology becomes available like a civilian laser strong enough to cut through most objects can be acquired… with this design you’d simply swop out the better laser. 1 – Toy Light Saber – for the handle… because let’s face it if your done…. and it doesn’t look like a Light Saber.. mission failure. 2 – Circular Mirrors – these should be about the width of the Light Saber handle, and you will need to drill a hole in them. MIRROR #1 the hole will be directly in the middle, MIRROR #2 the hole will be offset just a cm. from the middle. 1 – Green Pen Laser – This will supply the “light beam”… obviously again “in the future” the laser will be more powerful. 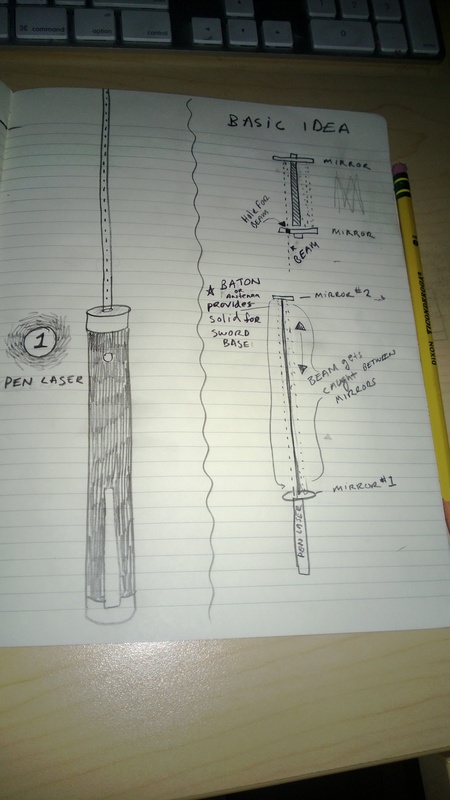 *** OR *** instead of the Martial Arts Extendable Baton… If you really wanted to get fancy, you could use a motorized Extendable/Collapsible car antenna… push a button… it extends… push a button it retracts… keep in mind the motor is slow… ( eeeeeeeeeeeee ) 20secs later…. isn’t really exciting… but again in the future or if you paid a ton of money you could probably come up with a faster motor and extendable/collapsible mechanism. 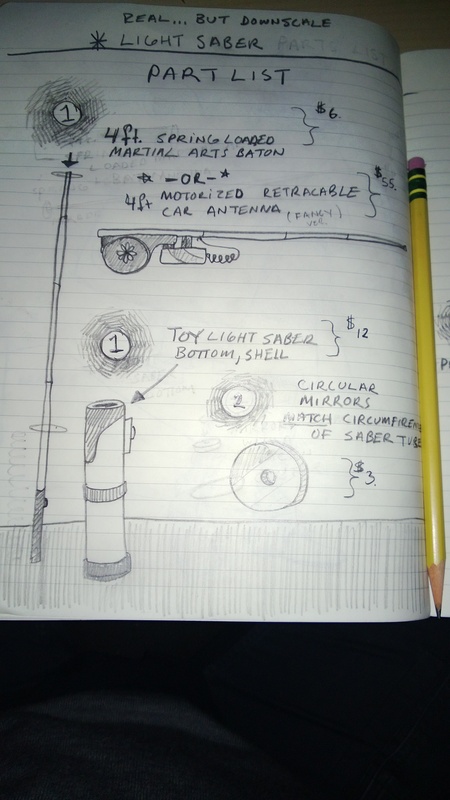 HERE ARE MY MOLESKIN SKETCHES – HAVE FUN….